Check out our new list of Fused Glass, Mosaic and Fused Windchime classes and sign up today. Don’t miss our huge parking lot sale coming in June. Provide us your info and receive an email about new products and specials when we add a new stained glass sale flier! Use our full contact form if you need to change your mailing or email address. The deals have passed but we still have the best selection of stained glass supplies, bevels, and art glass classes available in the Midwest. Page 1 – Several glass classes coming up in January & February! Beginner Stained Glass and Dinner and a Stained Glass Project ! Page 2 – More new classes coming up in January & February! Learn how to make a stepping stone or a fused Kaleidoscope. How about making glass flowers in your kiln? Learn new ways to repurpose your wine bottles into unique works of art! Page 3 – Christmas Open House brings all kinds of savings! Pre-Cut Fusible Glass Shapes make your holiday stained glass projects easier. Page 4 – Sale on Glass Grinders, Soldering Irons, Bevel Clusters and more! Page 1 – Moonlight Madness Sale is coming Oct. 24-26. The annual parking lot sale is our biggest event of the year. Glass up to 60% OFF! Select Fusing Glass (96) is 50% OFF! Page 2 – Glass as low as $2.99 sq. ft. is hard to find! Cutters Mate Tools are ON SALE and Bottle Cutters too! Don’t miss this sale or you have to wait for next year. Page 1 – Looking for inspiration? We have new classes starting soon. Check out our next class lineup: Beginner Stained Glass, Fused Glass Plant Stakes, Foil Overlay Hidden Image, Mosaic Table, Fused Glass Picture Frame and even a FREE Glass Cutting Demo! Page 2 – Don’t miss our Dichroic Glass at 50% OFF! We have a huge Clearance on Bevel Clusters-up to 40% OFF. Moonlight Madness Sale is coming October 24-26. Page 1 – Celebrating 30 years with blowout prices on Cutter’s Mate, Beetle Bit Systems and Gryphon Diamond Slicer Saw and much more. Page 2 – Our Giant Parking Lot SALE will have glass as low as $1.99 sq. ft. and 30% OFF books, slumping molds and Chemicals to name a few. Solder 60/40 only $11.99 pound! Fuser’s Reserve Glass is here and so cool. Page 1 – Dreaming about a new kiln? We have great prices on Digital Kilns! Several new classes are starting soon. Such as: Dinner And A Project, Dazzling Garden Wind Chime class, Fused Shamrock Plate, Fused Flower Garden, Mosaic Mirror and Stepping Stones. Page 2 – Military Bevels are on SALE too! Page 1 – Ring in the new year with a new stained glass class like a Bevel Box class or Fused Jewelry class. Page 2 – Looking for the perfect gift? How about a kiln or a bottle cutter or even a precut Holiday Kit. Join us for our Open House on December 6th and see glass as low as $2.49 sq. ft. Page 1 – Moonlight Madness Sale is almost here! A parking lot full of glass , used tools, and FREE stuff! We have 60/40 Solder for only $12.99 roll and Colored Bevels for $1 each. Copper Foil on SALE! Too much to list! Check out Classes from Mosaic to Fusing! Page 2 – Moonlight Madness specials and even coupons for free stuff! Page 1 – It is time to get back to glass with new classes from Beginning Stained Glass to Fusing Holiday Plates. We have several new classes like the Mosaic 3-D Christmas Tree Light class, Dinner and a Project, Fused Kaleidoscope and Hidden Pictures. Page 1 – Huge parking lot sale on May 24, 25 & 27 with hundreds of sheets of stained glass at bargain prices. Page 2 – Used glass equipment and tools. Page 3 – New stained glass class schedule with exciting fusing classes, hole drilling class, stepping class, and kiln operation class. Page 4 – Bottle cutters on sale too! Page 1 – New classes to beat those winter blues! Learn new techniques in our beginner stained glass class and the beginner lead class.Learn how to drill holes in glass in the “Hole-y” project class! Spring Fused Plate coming soon. Page 2 – Looking for DiamondCRETE stepping stone mix? We have tons! Creator’s Bottle Cutter on Sale. Page 1 – Beat the cold with a new stained glass class! Page 2 – Great prices on Creator’s Bottle Cutter and diamond band saw blades really cheap! Looking for a new kiln? We have it! Page 4 – More glass classes and a new Frit Casting Demo coming in January. The perfect gift for someone who is hard to buy for! A custom etched Pyrex baking dish with their name permanently etched on the sides. 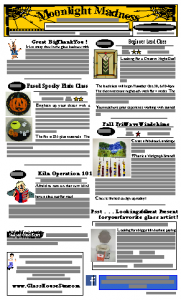 Page 1 – October Moonlight Madness, fused glass birdfeeder class, fused desk clock class, and mosaic mirror class. Page 2 – Fall festival ring class, prairie style lamp class, beveled snowflake class, and lighted mosaic Christmas tree. Page 3 – October 26 through 28th moonlight madness sale and coupons. Page 4 – Moonlight madness glass, solder and bevel bargains. Page 1 – New classes in store at The Glass House, including a wine bottle class, Mosaic Mirror, Fused Glass Classes and Hole Drilling classes. Page 2 – Slumping Molds on sale and Dichroic glass is 50% OFF! Spectrum’s Fusers Reserve has just arrived! Page 1 – Giant parking lot sale coming up with crates of glass, bevels, stained glass tools, band saw blades and much more at a great price. New classes coming up that include a beginner stained glass class and a fused clock class. Page 2 – New items just arrived such as a new adjustable stainless steel mold for the smaller kilns. Page 1 – New classes: now offering Wire Wrapping and Fused Pendant Combo Class or 10 Things to do with a Wine Bottle, or Hot Glass Jewelry Box class is open and waiting for you! Page 2 – We have Kiln specials that are HOT as well as Etched Military Bevels for your designs. Largest selection of Fusible Glass, Dichroic Glass, Molds, Precuts, Decals and much more in the Midwest!